The Silhouette Coefficient is used when the ground-truth about the dataset is unknown and computes the density of clusters computed by the model. The score is computed by averaging the silhouette coefficient for each sample, computed as the difference between the average intra-cluster distance and the mean nearest-cluster distance for each sample, normalized by the maximum value. This produces a score between 1 and -1, where 1 is highly dense clusters and -1 is completely incorrect clustering. The Silhouette Visualizer displays the silhouette coefficient for each sample on a per-cluster basis, visualizing which clusters are dense and which are not. This is particularly useful for determining cluster imbalance, or for selecting a value for \(K\) by comparing multiple visualizers. Implements visualizers that use the silhouette metric for cluster evaluation. The Silhouette Visualizer displays the silhouette coefficient for each sample on a per-cluster basis, visually evaluating the density and separation between clusters. The score is calculated by averaging the silhouette coefficient for each sample, computed as the difference between the average intra-cluster distance and the mean nearest-cluster distance for each sample, normalized by the maximum value. This produces a score between -1 and +1, where scores near +1 indicate high separation and scores near -1 indicate that the samples may have been assigned to the wrong cluster. 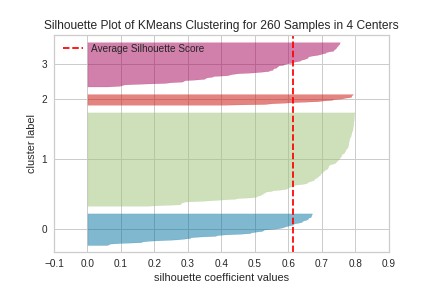 In SilhouetteVisualizer plots, clusters with higher scores have wider silhouettes, but clusters that are less cohesive will fall short of the average score across all clusters, which is plotted as a vertical dotted red line. This is particularly useful for determining cluster imbalance, or for selecting a value for K by comparing multiple visualizers. Should be an instance of a centroidal clustering algorithm (KMeans or MiniBatchKMeans). Mean Silhouette Coefficient for all samples. Computed via scikit-learn sklearn.metrics.silhouette_score . Silhouette Coefficient for each samples. Computed via scikit-learn sklearn.metrics.silhouette_samples . Number of clusters (e.g. n_clusters or k value) passed to internal scikit-learn model. Draw the silhouettes for each sample and the average score. An array with the cluster label for each silhouette sample, usually computed with predict(). Labels are not stored on the visualizer so that the figure can be redrawn with new data. Prepare the figure for rendering by setting the title and adjusting the limits on the axes, adding labels and a legend. Fits the model and generates the silhouette visualization.